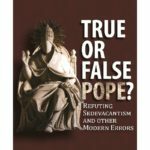 IN JANUARY 2016, the Society of St. Pius X published a 700-page book touted as the definitive refutation of sedevacantism and the ultimate vindication of the “recognize-and-resist” (R&R) position, John Salza and Robert Siscoe’s True or False Pope. When it first appeared, I thought it would merit a series of videos that would allow me to present various aspects of the sedevacantist case. But the Salza/Siscoe production turned out to be so fatally flawed that I quickly concluded it was simply not worth the time or the attention. In this video, I explain why. This was written by Rev. Anthony Cekada. Posted on Wednesday, July 27, 2016, at 4:32 am. Filed under Francis / Bergoglio, Sedevacantism, Sedevacantism: Objections, SSPX: Errors, Trad Controversies. Tagged Bergoglio, Francis / Bergoglio, John Salza, Robert Siscoe, sedevacantism, Society of St. Pius X, SSPX, True or False Pope?. Bookmark the permalink. Follow comments here with the RSS feed. Comments are closed, but you can leave a trackback. ‹ Hey Trads! Take This Pop Pope Quiz!